Aged wall plates and yellowing switch covers can take away from your home or business. 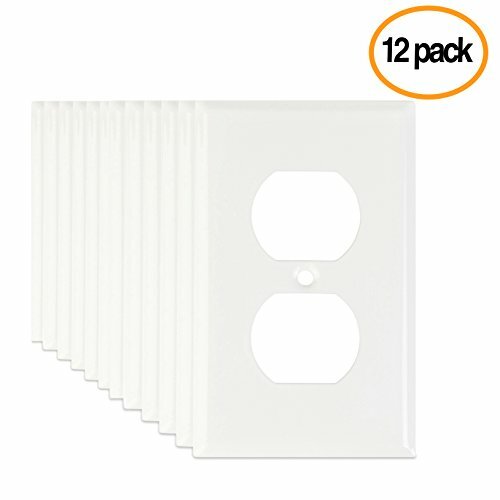 Why not make a simple upgrade and give it a clean, fresh appearance with these LoGest White Wall Plates Classy and functional, these outlet covers provide the perfect finishing touch to any design project. Designed for rugged use and highly trafficked areas, these wall covers are ideal for any residential, commercial or industrial application. They're expertly crafted using solid metal construction for optimum durability, holding up to everyday wear and tear to deliver long-term use for years to come. An economical way to make a great impact in your home, the LoGest Wall Plates are available in 6-, 12- and 60-count packages. These multi-pack options are ideal for electricians, contractors, home renovators and serious DIYers alike, adding value and convenience to any refurbishment. They're also available in single switch, one-gang and two-gang configurations, allowing you to cohesively upgrade all of your outlets and light switches at once. The addition of new wall plates can enhance the style of your home. With a smooth, white finish and contoured edges to enhance its appearance while maintaining functionality, the LoGest will make your walls look neat and tidy. Plus, your devices will have a better place to plug into. Created to provide safety and maintain an attractive appearance, these white wall plates will pop on any wall. Matching screws are included, painted to help achieve a flush mounted look. A simple but essential function, they will keep wires out of sight and furnish your walls with a simple yet elegant look.